Foxconn, The Most Suicidal Company Ever? Foxconn has a little problem. The Taiwanese manufacturing firm, who put together chips for Apple’s iPhone and Dell computers, among other companies, employs a whole lot of people at its factories. 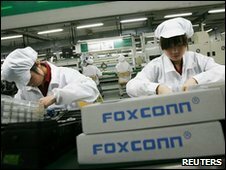 More than 8,000 people report to work for Foxconn every day; however, Foxconn has also become prone to worker suicide. Just hours after CEO Terry Gou toured the Shenzhen, China, location, a 23-year-old worker jumped to his death off the 7-story employee dormatory. That’s the company’s 10th successful suicide, and 12th attempted suicide!